In these days of celebrations and low temperatures, nothing beats a casserole to share with family or friends. It is a very popular stew, traditionally prepared outdoors by shepherds and fishermen, which still today occupies a prominent place in the cuisine of many places in our country. A consistent dish full of flavor that can be prepared with meat or fish. For the fish version it is recommended to use white fish with firm meat that does not fall apart while cooking and therefore corvina is a perfect alternative. 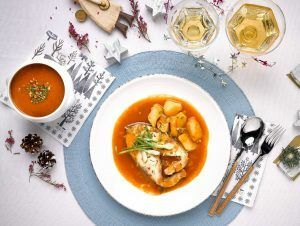 Originally the casserole was prepared with seasonal species but now, thanks to aquaculture and Frescamar, we can enjoy corvina throughout the year. Our recipe incorporates potato and leek and a base of fish broth to which smashed almonds and pine nuts are added to thicken the fumet. The touch of Brandy brings a delicious aroma to this casserole, very rooted in Spain, that is a very good choice for New Year’s meal, Epiphany or any family reunion.